This recipe comes from one of my very first cookbooks, America’s Favorite Recipes from Better Homes and Gardens, a well-worn papaerback, copyright 1966. In my early days of cooking, it was a favorite. I haven’t made this pork roast in years, but I prepared it recently and it was delicious. Since it was just the two of us, I used a much smaller roast and halved the other ingredients. The large version would be perfect for holiday entertaining. 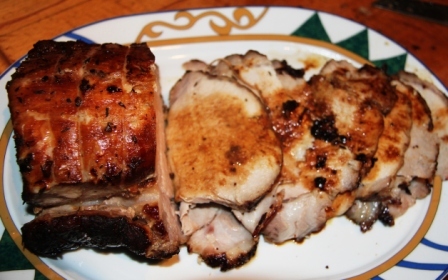 Place 4- to 5-pound boned, rolled and tied pork loin roast in a shallow baking dish. Rub with mixture of 2 tablespoons dry mustard and 2 teaspoons of thyme. Combine 1/2 cup sherry, 1/2 cup soy sauce, 2 cloves minced garlic and 1 teaspoon of ginger. Pour over meat. Marinate in refrigerator overnight. Turn occassionally. Remove meat from marinade, place on rack in shallow roasting pan, roast uncovered at 325 degrees F. until meat registers temp of 160 degrees F. Melt one 10-ounce jar currant jelly, add 1 tablespoon soy sauce and 2 tablespoons sherry. Stir and simmer 2 minutes, pass with roast. Makes 10 -12 servings.